Thekchen Chöling, Dharamsala, HP, India – Even at 8 o’clock it was hot in Dharamsala this morning. When His Holiness the Dalai Lama emerged from his residence he was met by costumed singers from TCV who escorted him to the Tsuglagkhang. The temple and its surrounding verandas were filled with young students. The monks who would normally have been sat there were assembled on one side of the yard down below. “I memorized this text myself when I was ten years old, so I was able to join in with you just now. It’s very important to know how the mind works. Peace of mind is not something that can be directed from outside. It needs to be approached from within. It’s because our minds tend to be unruly that we see problems in the world such as the shocking killing that is taking place and the growing gap between rich and poor. To tackle such problems we need a calm, disciplined mind. 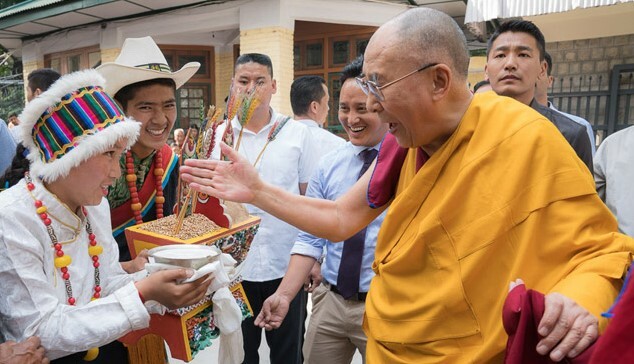 His Holiness remarked that the gist of the teachings does not need to be confined to a religious context, because its value can be experienced in day to day life. He said that he is keen that a sense of inner values should be taught in schools to influence the training of future generations. He mentioned that understanding of the workings of the mind and emotions are integral to most ancient Indian traditions that deal with concentration and insight (shamatha and vipashyana). His Holiness mentioned the Buddha’s advice not to take what he had taught on faith or at face value but to analyse it—advising his followers to scrutinise his teachings as a goldsmith examines gold. He praised this sceptical approach and explained how valuable it has been in his discussions with scientists over the last 30 years or so. He also stressed that the advice that things do not exist the way they appear is useful because it helps counter misconceptions about reality, as is the advice to tackle self-cherishing attitudes and cultivate altruism. His Holiness spoke of the origins of Buddhism in Tibet. He recalled seeing an empty space in a temple in Xi’an in 1955 where the Lhasa Jowo was said to have once sat. Despite this and other links to China, the Emperor Trisong Detsen, chose to invite the great master Shantarakshita from India to the Land of Snow where he established the Nalanda tradition. Tibetans have worked hard, through rigorous study down the centuries, to keep this tradition alive, something His Holiness said all Tibetans should be proud of. His Holiness remarked that compared to the ancient Indian knowledge of the workings of the mind and emotions, modern psychology is quite rough. However, he conceded that whereas scientists used to consider the mind to be no more than a function of the brain, they now have evidence that the brain undergoes measurable change as a result of prolonged meditation. He also referred to the interest some scientists are taking in cases of ‘thukdam’ in which clinical death occurs and yet the body remains fresh for some time afterwards. Observing that religious traditions all seem to have three aspects, His Holiness spoke of the practice of love and compassion, patience and tolerance, as well as contentment and self-discipline that they all have in common. He discussed their philosophical differences, that while many religions believe in a creator God, early Samkhyas, Jains and Buddhists have no such belief, considering the law of causality to be more significant. Nevertheless, he was clear that philosophical differences are no ground for quarrelling, since there are a wide range of variant views even within Buddhism. The third aspect shared by all religious traditions is cultural and as such is related to social customs, some of which are out of date and in need of change. He cited the role of the Dalai Lamas as political leaders as an example of something that needed changing, which he did when he retired in 2011. He also mentioned the Indian caste system and the application of Sharia law as examples of cultural traditions that are due for review. All conditioned phenomena are transient. All polluted phenomena are unsatisfactory or in the nature of suffering. takes refuge on the basis of view. Otherwise, you take refuge regarding the Buddha as the Teacher, the Dharma as cessation as the actual refuge and the Sangha as supportive friends. The important thing, he reiterated was to be a 21st century Buddhist and to take refuge on the basis of understanding. In relation to his conversations with scientists His Holiness declared that he never brings up topics like past and future lives or nirvana. He said that he admires scientists’ broad-mindedness and their willingness to change and improve their understanding. Asked how he remains happy every day, His Holiness’s first reply was that he regards all 7 billion human beings alive today as his brothers and sisters, a reflection he finds helpful and powerful. In the context of disturbing emotions being based on a misconception, a clinging to a sense that things exist as they appear, he also finds cognitive therapist Aaron Beck’s observation that our sense of anger or attachment is 90% mental projection not only to be helpful, but also in tune with Nagarjuna’s advice. Through the elimination of karma and affliction there is nirvana. Karma and affliction come from conceptual thought. These come from mental fabrication. He concluded that taking a more holistic view and cultivating warm-heartedness are a sound source of happiness. Teachings for Tibetan youth will continue tomorrow morning.